Its been pretty much hassle free internet for years now, the nice thing about it is that when they have a problem you can go and see what it is and what they are doing about it. Weird that I should get my first ever subscription sales at iStockphoto and Fotolia on the same day. Hmmm, there is a bit of payout difference there! 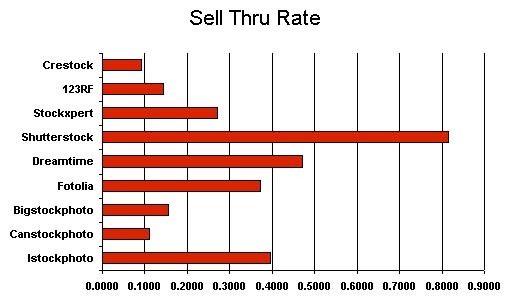 After reading the article over at www.microstockdiaries.com I decided I should work my own Sell thru Rate out, you can read the article for yourselves if you need to know how to work it out 😉 I like these results because they are in no way influenced by referrals or referral earnings. So now we can see that apart from Shutterstock still being ‘the daddy’, Dreamstime is out in front of iStock which ties into the sales pattern I get from Dreamstime which always seems to sell images of all ages whether newly submitted or older images that I never thought would sell. You do hear about the different agencies weighting their search alogirithm (a mathematical equation that filters the results) in favour of new images and ‘best match’ etc and I’d say this pretty much proves that. Akismet has protected your site from 680 spam comments.